The lamb's creation paved way for breakthroughs. Yet mysteries persist. Months before the FDA's December announcement that meat from cloned animals is safe to eat, employees at Cyagra in Lancaster County were carving into cloned steaks several times a week. The Elizabethtown company clones cattle, so it volunteered samples from 11 clones and 11 ordinary cattle for tests requested by the U.S. Food and Drug Administration. That left workers with a lot of leftovers, said Cyagra spokesman Steve Mower. They started with the steaks. When those ran out, they ate cloned hamburgers, tacos, lasagna and meat loaf, most of it prepared by the company's receptionist. But 100 miles away in Williamsport, Md., one of the company's first clones, named Cyagra-Z, was wasting away - losing 500 of her original 1,000 pounds. A veterinarian couldn't figure out what was wrong with her, said the clone's owner, Greg Wiles. Cyagra-Z died in late January. A decade after Scottish scientists stunned the world with a lamb called Dolly, scientists still can't say whether cloning had anything to do with the premature death of Cyagra-Z at age 6, or of Dolly herself, who got arthritis and succumbed to a lung disease at the same age. Yet, the last decade of animal cloning has yielded insights into the workings of life - including a new appreciation of its complexity. Clones carried copies of another animal's DNA, and yet they often came out surprisingly different from their originals. Comparing them would seem a great test of nature vs. nurture, except we now understand there's a whole side to nature that goes beyond the genetic code. That's because there's also an epigenetic code, which combines nature and nurture. It's written by proteins and other chemical structures that surround or attach to DNA and determine how the code is read - hiding some stretches and exposing others. When compared to their originals, "clones are genetically identical, but epigenetically they are quite different," said biologist Rudolf Jaenisch of the Whitehead Institute in Cambridge, Mass. Little is known about the sheep Dolly was cloned from. By the time Dolly was born, her "mother" had already been made into lamb chops. The sickly Cyagra-Z, on the other hand, was cloned from a cow named Zita - the cattle industry's top-rated cow of 1998. But Cyagra-Z was so much smaller than the original, her owner said, "we started calling her Mini-Z." Temple University biologist Keith Latham has a good idea why clones differ from animals conceived the usual way. In his lab, he studies mouse clones at the first stage of life and finds a vast difference in the way the cloned embryos read and express the genetic code. The concept of cloning goes back to the early 20th century. Around 1914, German embryologist Hans Spemann pondered whether each of our cells holds a copy of our full genetic code. It was assumed that fertilized eggs carried it, but nobody knew whether that same information was copied in full as cells divided and specialized. Spemann proposed what he called a "fantastical experiment" to find out. First, you'd take the original genes out of an egg and replace them with the gene-carrying nucleus from an adult animal's cell. If the adult cell held the whole code, he reasoned, it might develop into a new animal. It was, in a nutshell, cloning. The first success came in the 1950s at what is now Fox Chase Cancer Center. Robert W. Briggs and Thomas J. King took nuclei from frog embryos and cloned them to create tadpoles and, later, frogs. Other clones followed, born from embryo cells taken from fish, sheep and cows. Inducing an embryo nucleus to act like part of a newly fertilized egg was one thing. Turning the clock back this way, with an adult cell, was another. Finally, in February 1997, word got out that Scottish researchers had cloned Dolly several months earlier - with the udder cell of a 6-year-old ewe. Thursday was cloning day at Latham's lab. Colleague Zhiming Han huddled over her microscope, deftly working a hair-thin pipette into a mouse egg to capture its genetic material. Latham pointed out her quarry - a spindle that holds the genes. After she removed the spindles from a handful of eggs, Han injected them with nuclei from adult mouse cells. In principle, this is the same sort of nuclear transfer that led to Dolly, except Dolly's creators didn't inject the new nuclei - they used an electrical pulse to induce it to fuse with the egg. Latham's cloned embryos, like the ones that gave rise to Dolly and Cyagra-Z, start with a nucleus that was once part of a specialized cell. Even after it's transferred to an egg, it still acts somewhat like a skin cell, or nerve or muscle or something else, expressing genes that are supposed to be shut off in a developing embryo. "Cloned embryos suffer from an identity crisis," Latham said. In the next couple of days, the cells Han has cloned will divide in an incubator. Their formerly specialized nuclei will start doing what Latham calls reprogramming. It's a massive remodeling of the epigenetic packaging, and most cloned embryos don't survive long enough to finish, he said. "The mystery of cloning is why that 1 or 2 percent make it through." Those clones that make it may still have some abnormalities, said Whitehead's Jaenisch, but they're not likely to pass them down to future generations. When cloned animals reproduce, he said, most epigenetic abnormalities will get corrected in their eggs or sperm. Scientists say cloning research is closing in on long-promised medical advances. "What the egg does is not a miracle," Jaenisch said. By teasing out its secrets, there's a chance to create a substitute for embryonic stem cells that bypasses the need for eggs, or embryos. Meanwhile, James Robl, founder of the Connecticut- based biotech company Hematech, is using cloning to introduce human genes into cattle engineered to produce medically useful antibodies. Others are cloning pigs as potential organ donors or test animals. Pigs are close to our size and, like humans, eat an omnivorous diet, said Jorge Piedrahita of North Carolina State University's vet school. There's a huge demand for cloned pigs that model human diseases. "If we could make a cystic fibrosis pig," he said, "there would be 10 labs dying to get ahold of that pig." But with the cost of cloning at $17,000, why would anyone clone ordinary farm animals? Because they can command surprisingly high prices - especially the ones with good pedigrees. Greg Wiles said he paid $91,000 for Zita back in 1991. He knew he had overbid, he said, but he sensed she was special. In 1998, he said, she was ranked No. 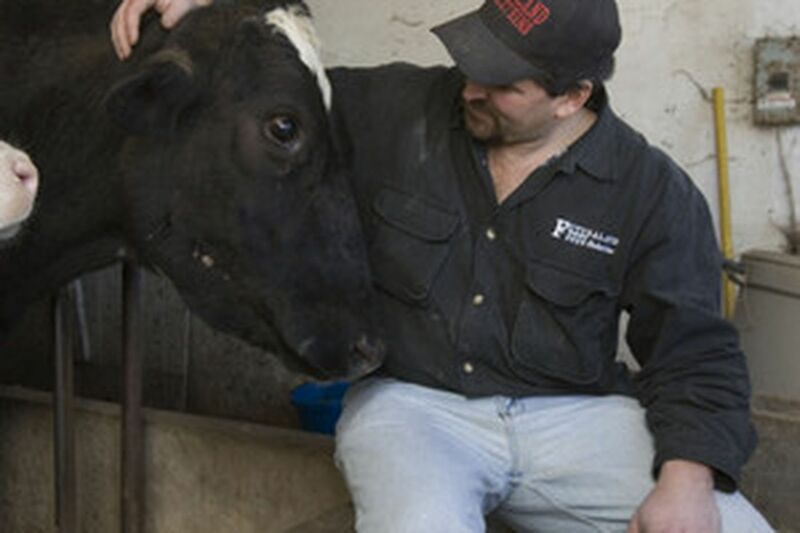 1 in the country in a system set up by the U.S. Department of Agriculture and the Holstein Association USA. She was not only a good milk producer - she was a female stud. Breeders paid tens of thousands for embryos made from her eggs, he said, to be gestated by lesser cows. With modern breeding technology, a cow with good genes can have up to 100 calves. In 2001, a representative of the Holstein Association asked whether Wiles wanted to have his aging but beloved Zita cloned. Cyagra had agreed to do the job free of charge. "At the time," Wiles said, "we thought that was a really good idea." In 2001, the company delivered two clones, Cyagra-Z and another he called Genesis-Z. But a few months later, the Food and Drug Administration told him not to sell milk or meat from them or their offspring, pending safety studies. Buyers stopped asking for embryos from any of his cattle, he said, whether cloned or not. He attributes this to a public fear of clones as "Frankenfoods," or at least the industry's anticipation of that fear. He dumped gallon after gallon of milk from the clones. It was as if his farm was contaminated. When Cyagra-Z got sick, he said, he asked FDA officials whether they wanted to inspect her or test her milk. They never did. But Cyagra spokesman Mower said his company could never get Wiles to help it with any of its testing until he started to lose money. "We never heard of it, having a problem, until he was going bankrupt," Mower said. Some experts say the fear of eating cloned food is unfounded. "I'd eat cloned meat or milk in a second," said Steve Stice, a cloning expert at the University of Georgia. In fact, he said, some of us already have. Years before Dolly came along, scientists had been cloning animals from embryonic cells, but because that wasn't as difficult, nobody created any public fanfare or worried about the milk or meat they produced. Wiles' experience does help dispel the notion that human cloning would produce a good "copy" of a human being. His other Zita clone, Genesis-Z, does take after her progenitor to some extent, he said, but she isn't a top-rated cow. "She produced a fairly good amount of milk, but she wasn't the same. . . . She wasn't as good."